Bruce Kulick became a guitar hero when he was asked to join KISS in 1984. 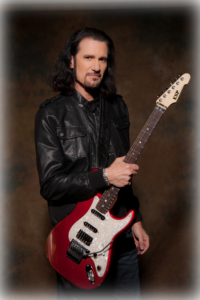 As their lead guitarist, Kulick was featured in the band from ’84 till ’96, performing all around the world in addition to his recordings and videos with the iconic band. During those years, he earned multiple Platinum and Gold records and video awards. He’s also heavily featured on KISSOLOGY II and III, the KISS DVDs spanning their historic 45 year career. In addition to his years in KISS, he toured or recorded with Meatloaf, Billy Squier, Michael Bolton, Avantasia, Lordi, and many other artists around the world. In 2010 his solo album, titled “BK3,” was one of Classic Rock Magazine’s Top 50 albums that year, featuring guests like Gene Simmons, Eric Singer, Tobias Sammet (Avantasia), Steve Lukather (Toto) and more. Aside from his three solo CDs, his resume features over 60 album credits. The band that he formed in 1998 with John Corabi called UNION, still has a loyal following. Since 2000, Bruce has been the lead guitarist for Grand Funk Railroad, “The American Band”. Bruce has also been a featured counselor since 2006 for the Rock N Roll Fantasy Camp. He frequently travels abroad sharing his music with his faithful fans. More recently he has released music performing with his wife, Lisa Lane Kulick.